My tour guide was the lady in post 634. She was showing off the candling technique to us, so I bet she had worked on the floor previously, and maybe still did as needed. She walked through slow enough for me. We stopped in interesting locations for a minute or three, and walked past dormant areas quickly. I also got the vibe that everyone liked working there. But I couldn't help thinking about how it would be tedious to sand the bracing on 150 guitars a day by hand. I saw some things in your pictures that they didn't show us. 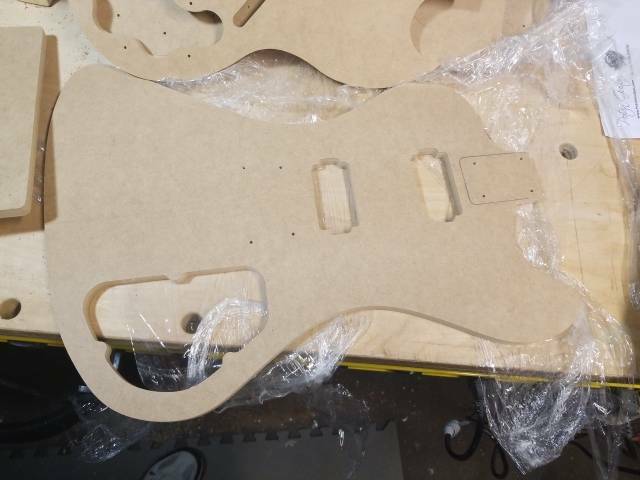 The lady said it took a few months for a guitar to get made from start to finish, so I bet they focus on certain parts of the build at certain times instead of having a true assembly line where a board goes down the line and comes out as a guitar a day or two later after you allow for glue and finish drying. Maybe I'll do it again another time. Between that old fucker asking stupid questions and the guide being in a hurry, it could have been more enlightening. He's in blue. Kept interrupting Ben and asking things like, what's this one do that that one won't do? Pointing at a ukele next to a 6 string. I was fine while it was going on, it's just in retrospect that it seemed rushed. Last one of the day, I guess. One of the guys on my tour struck up a conversion with one of the workers rasping a neck into shape and lingered behind for a minute or so. It was a fairly relaxed tour. We were the 2:00 or 2:30 tour I think. Everyone was talking with our guide as she led us through. She was clearly well liked and enjoyed chatting with them too, calling them all by name. Even pointing out the new person who had only been there a month but was doing a great job. Clearly some jobs are better than others. The repair department requires broad skills and a good head. Each day is going to be a little different. Did the bocote up today. This one is 25.5" scale. Yeah, very dramatic grain. I've got the Rd in mind for this piece. Pat wants a silver burst finish. This shape is the Gibson RD Artist. This is also the body color he wants. Most Gibsons are 24.75" scale, but the Rd is the same 25.5 as Fender's two big models, the Stratocaster and the Telecaster. Dad has gone back to the SG body after considerable internal debate between that and a Les Paul body. So as it stands, dad gets either the bubinga or the cocobola, as they are both 24.75"
The templates for all 3 bodies will arrive tomorrow, so this 2 guitar build will finally get rolling here soon. Yah, dad wants an opaque painted finish. In that red on the Les Paul. So I'll have to get that figured out. I failed on the first try, but I think I've learned how to do it by now. Seems a shame to do opaque finish on fine figured wood. The part I'm going to paint is poplar. Not very pretty. 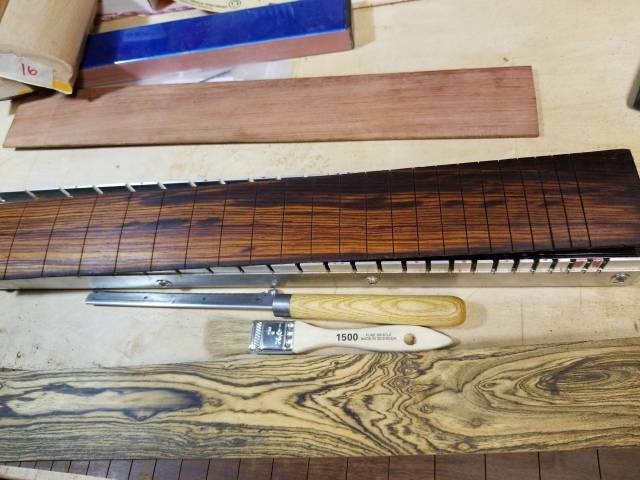 The fret boards I've been showing you recently will be unfinished. They are hard and close grained enough to endure without a finish. I like the trend of thank you notes from builders/suppliers. Little human connections.